Thierry Henry previously worked with Belgium's national team as an assistant manager. The Ligue 1 side, AS Monaco appointed the former Arsenal striker, Thierry Henry as the new manager. 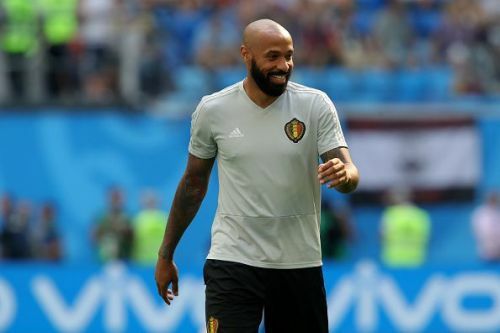 Henry previously worked with the Belgium national team as an assistant manager but will now take over from Leonardo Jardim, who was sacked by the Les Monégasques's earlier this week. Portuguese boss, Jardim was appointed in 2014 and led the club to the French title in 2017, their first title since 2000. He also guided the team to the Champions League semi-finals during the 2016-2017 season. Thierry Henry started his professional playing career with AS Monaco and scored 20 goals in 105 league games for the club before joining Juventus in 1999. However, he left Juventus to join Arsenal after just six months and established himself as one of the best strikers in the world. He scored 175 goals in two different spells for Arsenal and is currently the Gunners' record goalscorer in the Premier League. Henry also played for Barcelona and New York Red Bulls during the course of his career. Thierry Henry scored 51 goals in 123 games for the French National team and won the FIFA World Cup 1998. Monaco started the season poorly and won just one of their opening nine league fixtures. They are 18th on the Ligue 1 table with six points and lost five of their nine league fixtures. They are struggling in the Champions League as well and are yet to register a win in the competition. AS Monaco will play Strasbourg after the international break and then they will make a trip to Belgium to play Club Brugge for their next Champions League fixture. Twitter reacted to Henry's appointment as the AS Monaco manager and here are some of the best tweets. Steven Gerrard is Rangers manager. Frank Lampard is Derby manager. Thierry Henry is Monaco manager. John Terry is Aston Villa assistant manager. Utd legend Ryan Giggs in now a manager. Liverpool legend Steven Gerrard is now a manager. Chelsea legend Frank Lampard is now a manager. Arsenal legend Thierry Henry is now a manager. Just need Richard Dunne to become a manager now so that there’s a City legend managing someone. Hope Thierry Henry is a better manager than pundit.